After the phenomenal reaction to the launch of our POS Advertising Displays and POS PCAP Touch Screens, we are delighted to announce the last new addition to our range of 10″ POS Displays. The new 10″ POS Professional Monitors have arrived in style. 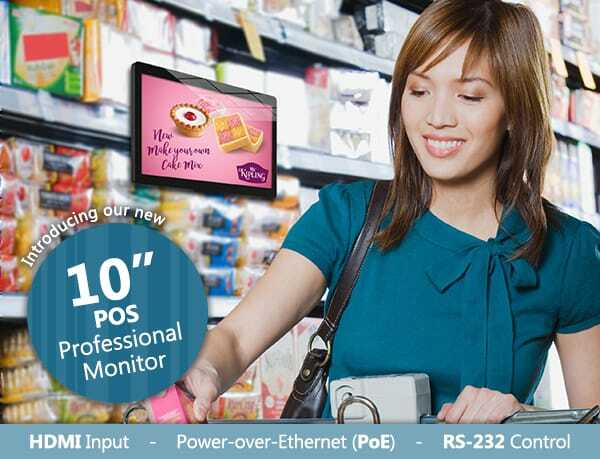 The stunning commercial grade monitor is perfect for public environments such as shelf edge and POS displays. With the HDMI input you can attach external devices such as media players and power your screen with PoE (Power Over Ethernet). Control, customise and scale the monitor via RS-232 for the ultimate control. The 10″ POS Professional Monitor is the latest addition to our POS range. This range includes our POS Advertising Displays, POS Network Advertising Displays and POS PCAP Touch Screens. The new 10″ POS Professional Monitors are in stock now and ready for immediate dispatch. Get in touch today to take advantage of these incredible new displays. For the latest prices and special offers click “here” or give us a call on 0121 421 4458.